I'm sitting at the giant wooden kitchen table I inherited from my father, feet up on a chair opposite, staring blankly at my computer. Behind me, a load of dripping handwashing is slowly causing a puddle - after seeing Bekki's amazing forecast at a conference yesterday, I was inspired to re-block my increasingly misshapen one. Flatmate-Kirsty is sitting on the floor with her back against the radiator, wrapped in a giant blanket and reading the Guardian magazine. Her hair is alarmingly straightened, after a cut on Thursday. We are both failing to get up and go out for cocktails and general glamorousness, and I'm half re-writing a lesson plan for Monday. We are contemplating making curried parsnip soup for dinner. Me: I want to blog those red socks but I can't think of anything to say about them. So, here you go: Socks, pomatomus to be precise. They are done, and red, though I tend to subscribe to the view all pomatomus should really be blue/ green I somehow felt the yarn called for the pattern. It's Araucania Ranco Solid in case you were wondering. They are first pair of socks I've managed the two-socks-at-once trick. Hence the "Grrrrrrrrrrrrahhh" noise. Hear me roar. *sotto voce* though I did cheat for a few rounds at the heel and them worked one at a time, the flap was just getting in the way (admittedly, I was drinking, doing a pub quiz and teaching Kirsty figure-8 caston at the same time, there is a limit to my multi-tasking). I liked this two-at-once business, I'm going to do it again. Ravelled here. Now I'm off to bake an apple and plum crumble and then an early night. Working tomorrow. the socks look great. 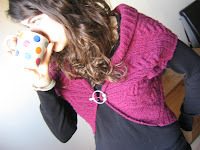 i too feel pomatomi should really be in a blue/green colorway, but, really, the pattern looks great anytime! fab fab fab socks. and the colourway. I love the poms in pretty much any colour, but really like the red of yours. These are gorgoues! 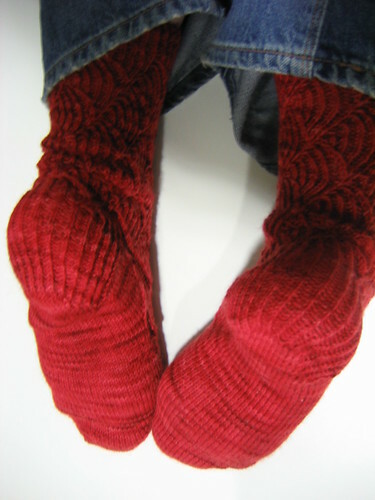 Especially the heel view, a whole new perspective on some beautiful socks! more like "red! HUZZAH!" :) great color choice. Stupendous as per your usual, love them against that green wall especially. I think they look fabulous in red! Gorgeous! They look fabulous in red. Those socks are awesome! Love the red. Bravo le rouge. Red is always a great colour, and your socks are fabulous. Beautiful socks. 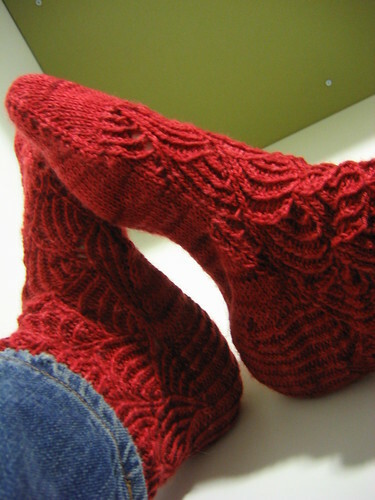 Pomatomuswhatsit is my absolute favourite ever sock pattern. Those look great in that color! And you've reminded me that I've had a single Pomatomus sitting in my WIP bin for about a year now. Yikes. Like the pomatomi! Good to see you on Friday. How did the reblocking of Forecast work out? Fantabulous knit! And so red! that red is so jolly and, um . . . *chewy*. (If you see what I mean). 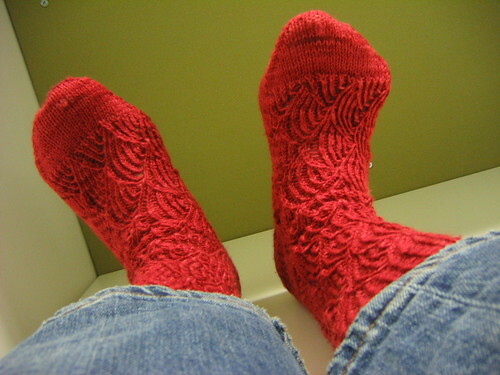 I am so impressed you knit lacey socks, two at once!